Primosch’s instrumental, vocal, and electronic works have been performed throughout the United States and in Europe by such ensembles as the Los Angeles Philharmonic, the St. Paul Chamber Orchestra, Collage, the New York New Music Ensemble, and the Twentieth Century Consort. His Icons was played at the ISCM/League of Composers World Music Days in Hong Kong, and Dawn Upshaw included a song by Primosch in her Carnegie Hall recital debut. Commissioned works by Primosch have been premiered by the Chicago Symphony, Speculum Musicae, the Cantata Singers, and pianist Lambert Orkis. 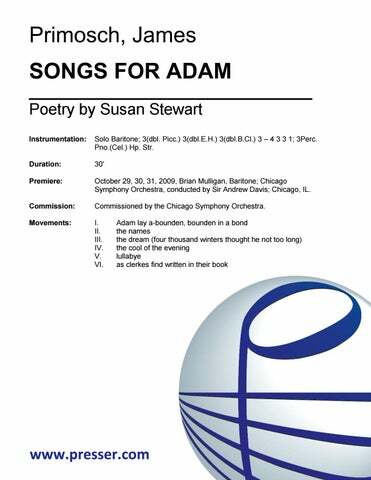 A second Chicago Symphony commission, Songs for Adam, premiered in October, 2009 (with baritone Brian Mulligan, in performances conducted by Sir Andrew Davis); and Luminism was commissioned and premiered by the Albany Symphony in May, 2010. Among the honors he has received are a grant from the National Endowment for the Arts, a Guggenheim Fellowship, three prizes from the American Academy of Arts and Letters (most recently, an Academy Award in 2010), a Regional Artists Fellowship to the American Academy in Rome, a Pew Fellowship in the Arts, the Stoeger Prize of the Chamber Music Society of Lincoln Center, and a fellowship to the Tanglewood Music Center where he studied with John Harbison. Organizations commissioning Primosch include the Koussevitzky and Fromm Foundations, the Mendelssohn Club of Philadelphia, the Folger Consort, the Philadelphia Chamber Music Society, the Barlow Endowment, and the Network for New Music. In 1994 he served as composer-in-residence at the Marlboro Music Festival. Recordings of twenty-one compositions by Primosch have appeared on the Albany, Azica, Bard, Bridge, CRI, Centaur, and New World labels, with new discs of vocal and choral works planned. James Primosch is also active as a pianist, particularly in the realm of contemporary music. He was a prizewinner at the Gaudeamus Interpreters Competition in Rotterdam, and appears on recordings for New World, CRI, the Smithsonian Collection, and Crystal Records. He has worked as a jazz pianist and a liturgical musician. Since 1988, he has served on the faculty of the University of Pennsylvania, where he directs the Presser Electronic Music Studio. 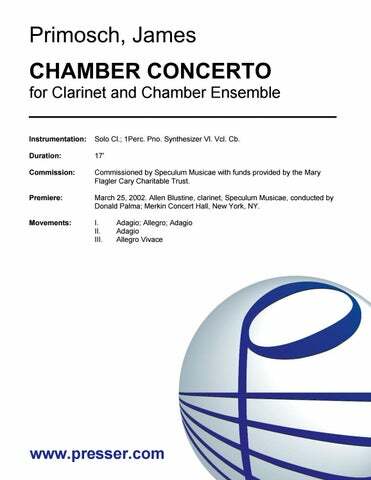 for Clarinet and Chamber Ensemble 17:00 Solo Cl. ; 1Perc. Pno. Synthesizer Vl. Vcl. Cb. 18:00 1(Picc.) 1 2(B.Cl. ext.) 0 – 1 1 1(F Attachment) 0; 2Perc. Pno. Str. for Orchestra 21:00 3(Picc.) 3(E.H.) 3(B.Cl.) 3(Cbsn.) – 4 3 3 1; Timp. 4Perc. Pno.(Cel.) Hp. Str. for Orchestra 15:00 3(Picc.) 2 3(B.Cl.) 3(Cbsn.) – 4 3 3 1; Timp. 3Perc. Hp. Pno. Str. 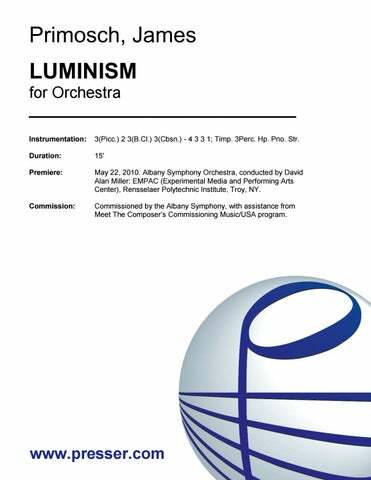 for Orchestra 11:00 3 3 3 3 -4 3 3 1; Timp. 2Perc. Hp. Str. 6:00 2(1 dbl. Picc.) 2 2 2 – 2 2 2 1; Timp. 3Perc. Str. 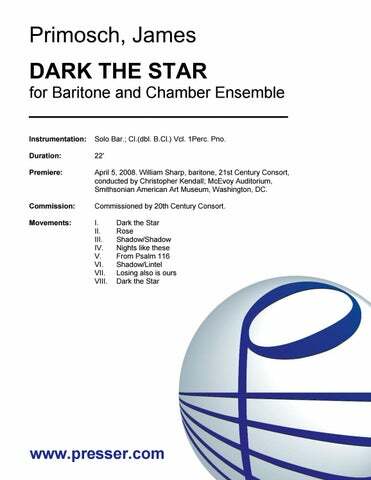 for Baritone and Chamber Ensemble 22:00 Solo Bar. ; Cl.(dbl. B.Cl.) Vcl. 1Perc. Pno. 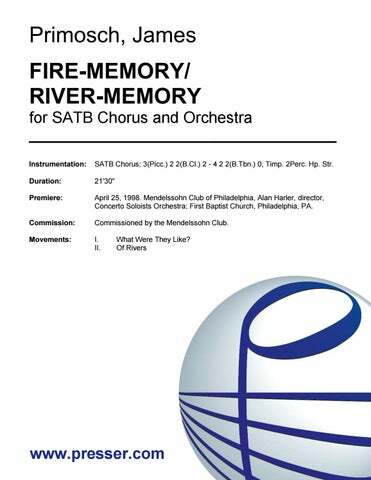 for SATB Chorus and Orchestra 21:30 SATB Chorus; 3(Picc.) 2 2(B.Cl.) 2 – 4 2 2(B.Tbn.) 0; Timp. 2Perc. Hp. Str. 12:00 Sop. or Mezzo-sop. ; Fl.(Picc.) Cl.(B.Cl.) Vln. Vcl. Perc. Hp. for Soprano and Orchestra 18:00 Solo Sop. ; 3(dbl. Alto Fl./Picc.) 3(dbl. E.H.) 3(dbl. B.Cl.) 3 – 4 3 3(B.Tbn.) 1; Timp. 3Perc. Cel.(Pno.) Hp. Str. for Soprano, Baritone, and Ancient Instruments 30:00 Ancient instruments (four players): Renaissance Lute, Citole, Medieval Hp., Psaltery,Treb.Viol., 2 B.Viols, Vielle, Rebec, 6Rec. (Sopranino, Sop. 2Alto, Ten., B. ), Dumbek, Nakara, Crotales (E, B), Susp.Cym., Tamb. 30:00 Solo Sop., Solo Bar. ; Fl.(dbl. Picc., AltoFl.) Hp. 1Perc. Vla. Vcl. 30:00 Solo Baritone; 3(dbl. Picc.) 3(dbl.E.H.) 3(dbl.B.Cl.) 3 – 4 3 3 1; 3Perc. Pno.(Cel.) Hp. Str. 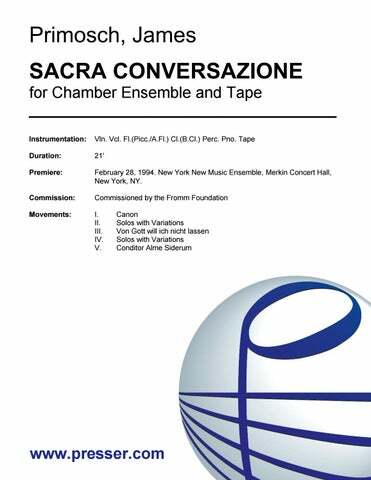 for Chamber Ensemble with Electronic Sound on Tape 21:00 Vln. Vcl. Fl.(Picc./A.Fl.) Cl.(B.Cl.) Perc. Pno. Not every composer’s music can support such weighty themes, but I find myself returning again and again to Primosch’s songs. …[his music] doesn’t strive always to be in a holy space, but instead to describe it and give it a human response. In this way Primosch is able to take us to, be in the presence of, and then take us out of, sacred time and space, an attribute which is at the center of the Western musical art form. …he is a composer that decidedly has a knack for selecting a small portion of text and maximizing its expressiveness. …gorgeous…it featured a brooding opening section, soaring and expressive vocal lines and creatively scored, beautiful instrumental writing. …22 minutes passes swiftly but with the sense of a journey taken that is of note and meaning, finding sacred space and then retreating from it. The composer’s gift with words catches the subtle rhythms of the text in a way that makes it seem as if he has simply freed the music lurking just under the surface of the words. Primosch’s work centers on two poems by Denise Levertov about the Vietnam War’s destruction, finding a note of irony in wrapping the bitter words in often brilliant, dissonant music. He made a strong effect with singing and playing that in places began softly, then swelled to near-outcry, then returned to silence. 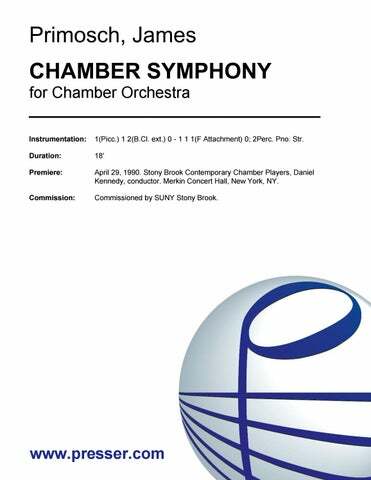 It revels in suspension and release, choral part writing that is set off very effectively by poetic orchestration, a solo violin part that weaves in and out of the neo-impressionist orchestral light and shadow. The final of the two movements has some fireworks of an orchestral sort and more of the beautiful choral writing that permeates the work as a whole. 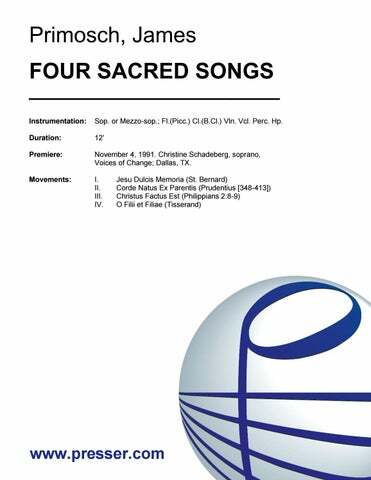 In Primosch’s “Four Sacred Songs,” the power of chant reasserted itself. The score is very approachable, handsomely made and austerely beautiful. 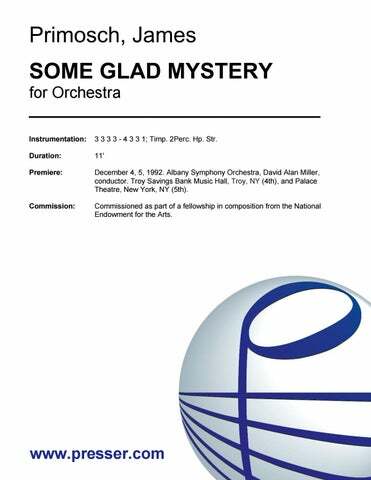 …distinctive scoring, filled with sumptuous textures punctuated by percussive tintinnabulation. Primosch is a composer whose work deserves wider exposure. 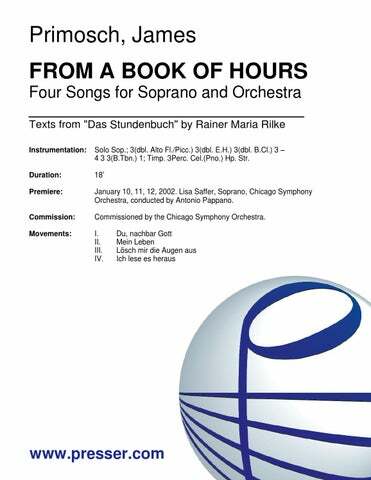 …reveals both his sensitivity to the texts and to orchestral color as a means of extending and enhancing the dramatic possibilities of the human voice. Rilke’s poems have a distinctly modern sensibility that was beautifully reflected in Primosch’s austere but profoundly thoughtful settings. Primosch’s musical language…is appropriately wide-ranging, sophisticated, and often unsettling. The poetic words are sensitively matched to music that evokes images of fire, Jacob’s ladder, an everyday god and deathbed sensations. …one of Primosch’s most striking cycles. These songs are unfailingly compelling, whether the musical language is complex or seemingly simple. 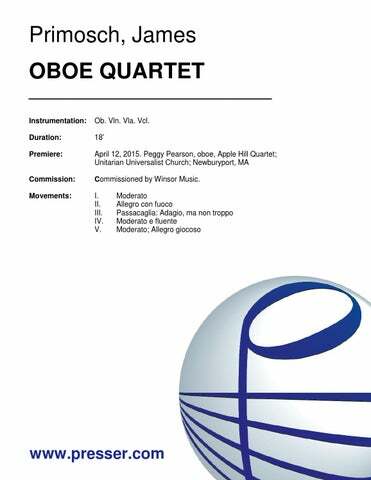 The work succeeds largely because of the variety of textures employed, from dense contrapuntal figures to a blaze of sound when dawn breaks at the end of Hopkins’s poem…the oboe lines lent the music a welcome and crucial depth. 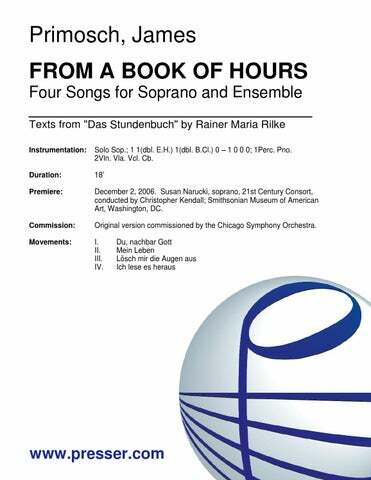 Primosch showed a particular gift for choral writing: The a cappella parts were beautiful. …the middle section, Nocturne…weighs in as a perfect composite jewel: 3:32 of elegant, electro acoustic sensuality. A preceding Variations and concluding Toccata comprise a listener’s pleasure. I’m certain I’m hearing a masterpiece. …an impressive sonata structure built up from an economical array of fourths and tritones, with electronic tape and…piano blending in fully notated synchrony. …a tour de force for piano and synthesizer… The unusual sounds from the Kurzweil synthesizer expand the timbral possibilities of the piano and the horizons of the listener. 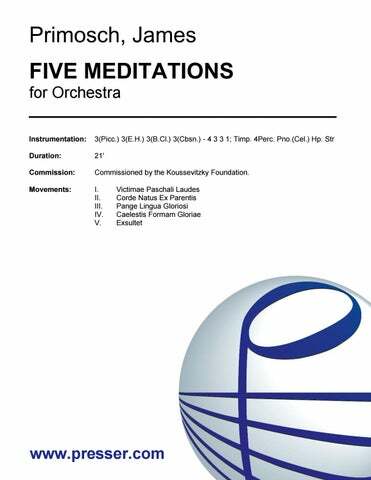 …there is something about Primosch’s music that both grounds and makes the composition soar. …”Come Unto These Yellow Sands” from Act I, scene ii was a big wow. Decidedly pleasing was the soothing but subdued closing duet “Our Revels Now Are Ended.” It left [this author] wanting more of Primosch. …intriguing and beautiful… Stewarts’s poetic images…melds comfortably with Primosch’s lyrical, essentially tonal harmonic grammar. The vocal writing for baritone ranges from introspective to angry declamation, bestriding a large orchestra that is used with acute subtlety, sensitivity and evocative instrumental color, never covering the singer. 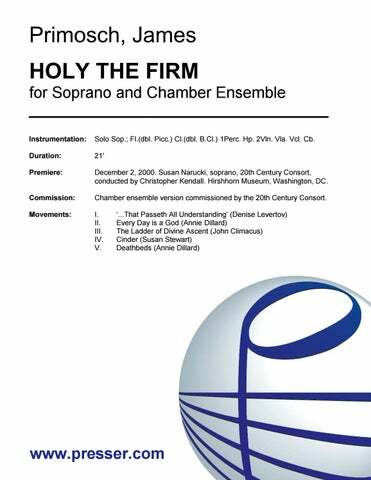 …much of the scoring is strikingly luminous and transparent. “Adam” is the work of a skilled melodist and orchestrator. 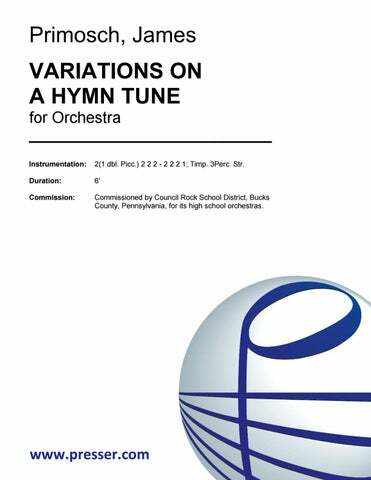 …a handsome, somewhat elegiac work, built around a hymn tune, written in a language that is both harmonically diverse and emotionally unified…a satisfying and personal statement. …Particularly striking… Primosch’s quartet…draws its musical raw materials from the hymn “Let All Mortal Flesh Keep Silence.” The hymn tune is serene, melancholy and medieval, and it makes a strong effect when Mr. Primosch brings it back unadorned between imaginative variations that range from the violent and harsh to the grandly romantic. James Primosch’s “Three Sacred Songs” for soprano and piano are tonal and ardent.